Do you think that car museums are only for big boys? Wrong! 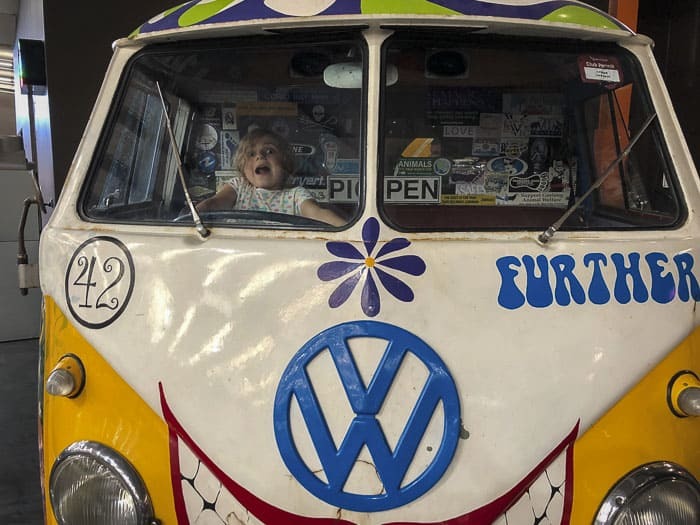 We were invited to visit the Gosford Classic Car Museum and we really enjoyed it… and we have three daughters. To be honest, it was not a museum that I would have thought to visit necessarily. 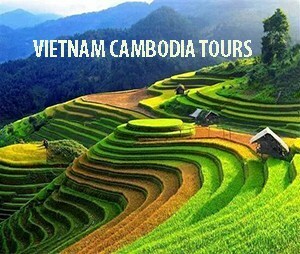 But, after the great experience that we had, I highly recommend it. Life is not all is about unicorns and fairy gardens! 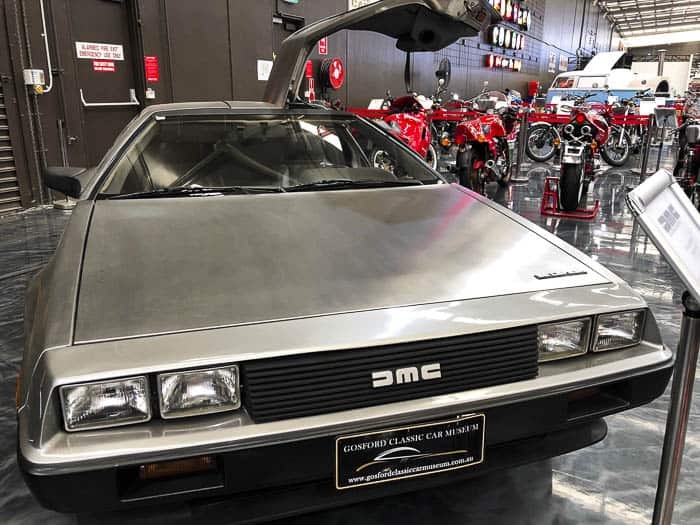 Gosford Classic Car Museum is the largest car museum in the southern hemisphere and one of the top five largest privately owned car museums in the world. The museum is home to an impressive collection of over 400 cars to the value of $70 million. 95% of the vehicles in the collection have been bought within Australia, with the remaining cars coming from the Soviet Union and Eastern Europe. Tony Denny, an Australian entrepreneur with a passion for classic cars, founded the museum. Over the years, he really has amassed a very diverse collection. 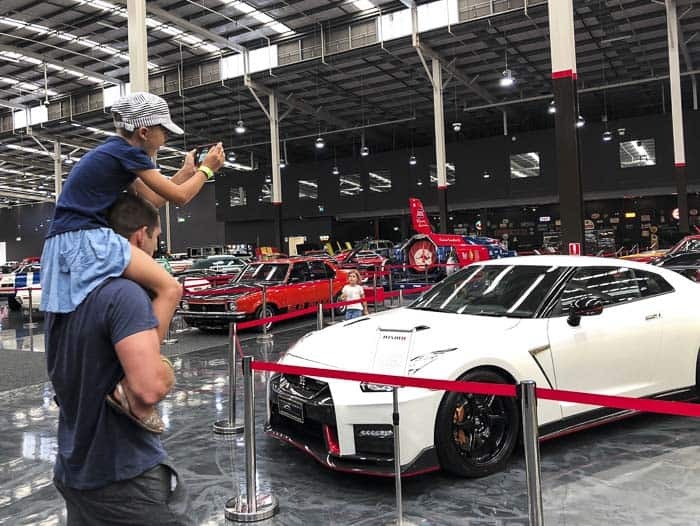 There is something for everyone to enjoy and appreciate; from vintage heroes, to Aussie muscle cars to modern supercars and everything in between! 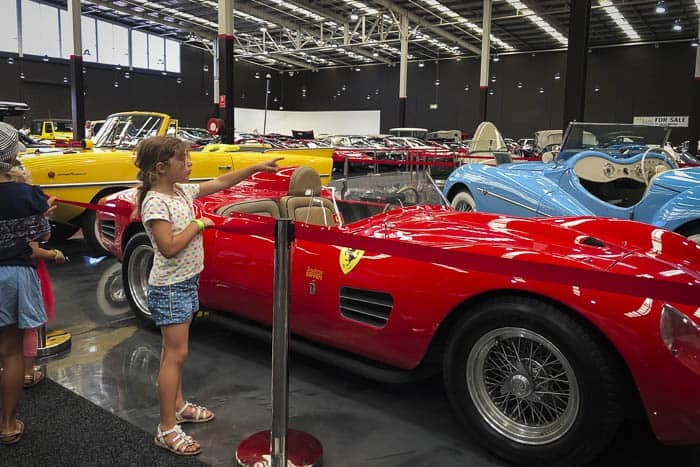 Here’s all you need to know to enjoy a visit to the Gosford Classic Car Museum with the kids. Opening hours: Wednesday to Sunday 9am – 5pm. Monday and Tuesday: closed. Note: call or check Facebook Page for public holidays. Mum’s report: I was truly impressed with the Gosford Classic Car Museum. My husband loved it and he could definitely have stayed longer exploring all the cars. There are great info boards about each car. Our daughters had lots of fun, too. The site is so big and full of cars that left nobody indifferent. You don’t need to be a car enthusiastic to enjoy the museum. Even if you are not into cars, you still can have a good time. Nearest station: Gosford Station (Central Coast & Newcastle Line). Once in Gosford, catch a taxi or bus from Gosford Station to the Museum, as it is not within walking distance. Several buses connect the Station with the Museum. From the stop, it is an 800 metres walk. Nearest ferry: daily ferries are available between Sydney, Palm Beach and Ettalong. From Ettalong Ferry Wharf, you can take a taxi or a bus. Bus stop nearby: Pacific Hwy after Yallambee Ave or Manns Rd. IMPORTANT NOTE: when you travel with public transport, always remember to double check the current timetables, as they can change. Children under 4 are free. Plus, the Museum offers a family ticket. 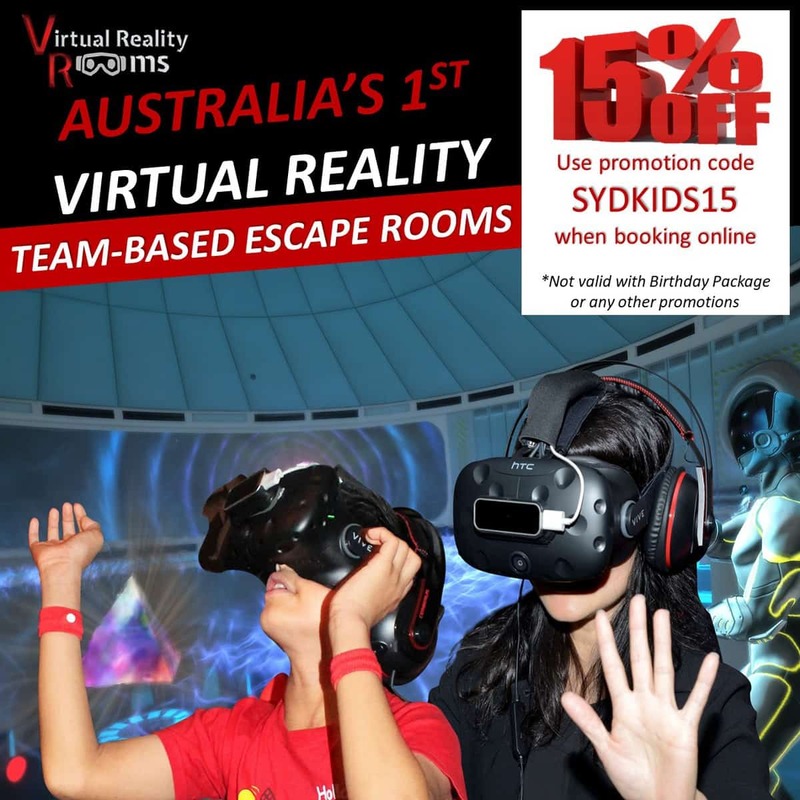 Being so close to Sydney, it is a great place to spend the day. 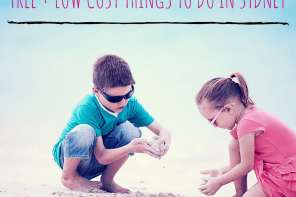 When you feel that kids have had enough of screen time, keep it in mind for rainy or cold days in winter. 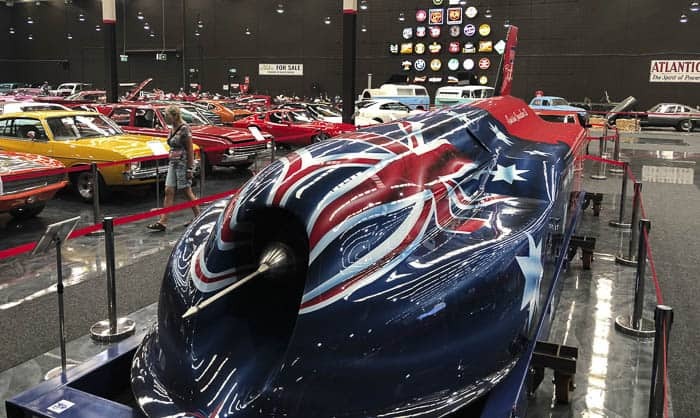 The Gosford Classic Car Museum is the biggest in the southern hemisphere. Visiting the museum is a good way to bond with your children’s grandfather. 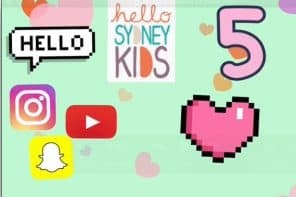 Let the oldies share some good memories with your children. Everyone can relate to this. The museum also has ordinary cars; there are not only Jaguars. My husband showed to our daughters the Holden that his parents used to have, for example. The Gosford Classic Car Museum is not a permanent exhibition. The car collection keeps changing. Therefore, every time that you visit the museum, you will see new cars. There is a sales department in the museum. You can even buy your dream car. 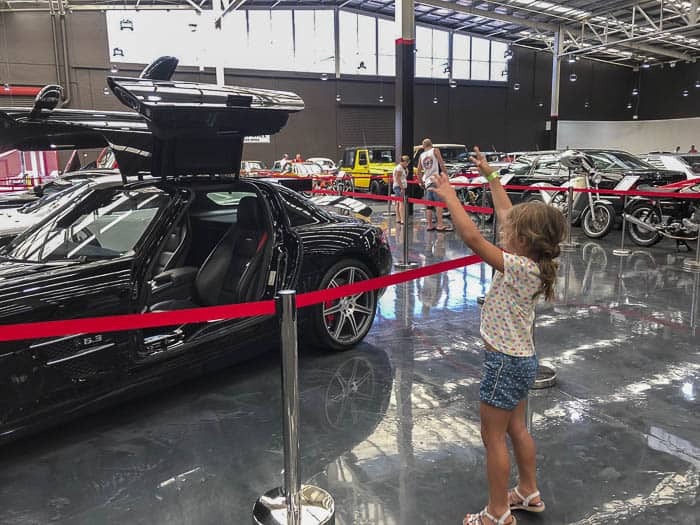 Visiting the Gosford Classic Car Museum could be a treat for Father’s Day or to do something special for someone’s birthday. The 200-meter square meter memorabilia store features a diverse range of motoring merchandise. We couldn’t help ourselves and purchased some good stuff like a VW doormat for our house, VW stubby holders and several replica toy cars. It is easy accessible. 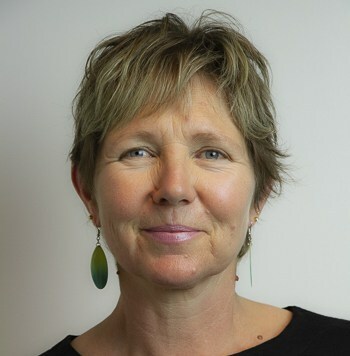 The museum is located in West Gosford (75 km from Sydney CBD). Take the M1 direction to Gosford; then, take the Gosford exit and follow the signs marked Gosford, Terrigal and Woy Woy. It only takes about 1 hour when the traffic is good. Easy to park. There is ample parking available at the Museum. Lovely staff. The staff were very kind and helpful when we asked some questions to them. Great facilities. Inside the museum, there is a lounge where you can sit down and take a break. The museum is pram and wheel chair friendly, too. There were so many cool cars that it was difficult to choose which ones we wanted to see first. 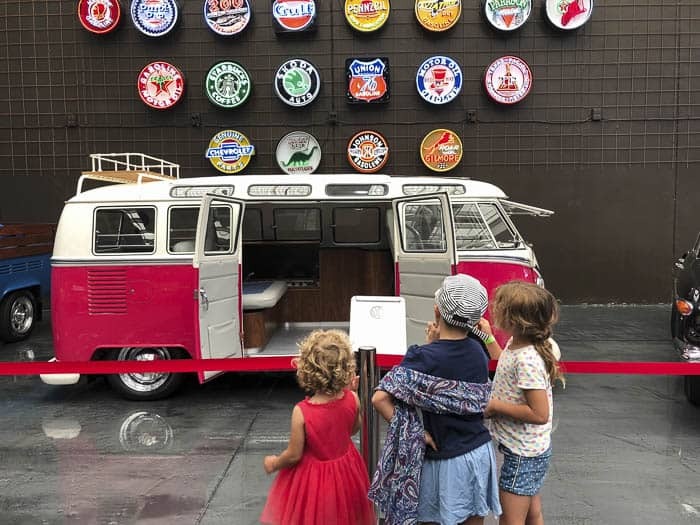 While my husband’s favourite cars were the full range of Holden’s from 1948 to 1978 and the collection of Ferraris, including the Ferrari Superamerica on display, my daughters showed lots of excitement when they saw the VW campervan type 2 Samba. Kids imagination is fascinating! They were talking about travelling with this van and they were discussing if the van had beds. 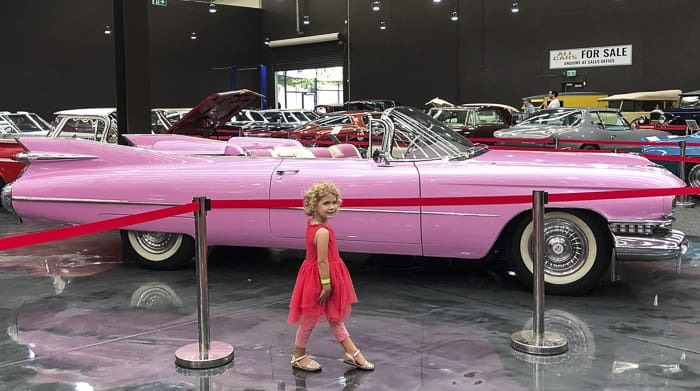 And, of course, Miss 3 year old loved the only pink car of the museum, the Cadillac Series 62. I liked lots of cars, too, but I think that the best part was to see my husband explaining some details about the cars to our daughters . In particular, my daughters were very interested in the Aussie Invader III, a rocket car that is powered by a 36,000 horsepower jet engine. This is the Aussie Invader III; a land speed contender, this car reached a top speed of 1026km/h in 1996, built and piloted by Australian daredevil Rosco McGlashan. My father would have loved to visit this museum. 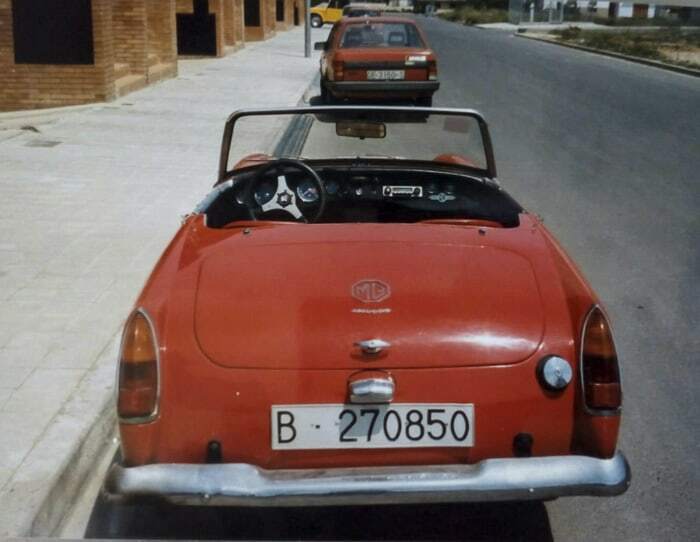 He had a MG red convertible for a while. It was not the same model as the one of the Gosford Classic Car Museum, but it was very similar. I have very good memories of the days that my father used to take us for a drive with that beautiful old classic! Maybe, the addition of a theatre where kids could watch some themed car movies or a kid’s corner with some crafts would be perfect. In spite of it, the museum is an attraction itself. With the great mix of cars on display, it is enough to keep the youngest entertained. 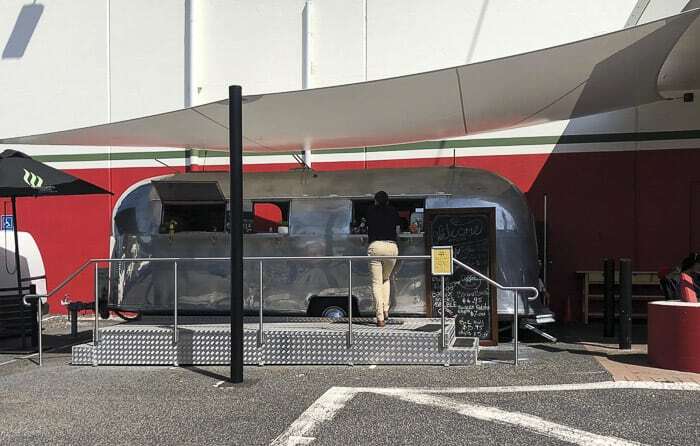 Next to the entrance of the museum, you can enjoy a nostalgic experience with the 1964 Airstream Kitchen Café. The menu offers a wide variety of international dishes as well as cultural twists on breakfast and lunch classics. The café has high chairs. Note: the café doesn’t have EFTOS facilities. Therefore, have some cash ready if you plan to eat, before or after visiting the museum. Or, if you need a super child friendly place to eat, Gosford RSL is an alternative. The Gosford Classic Car Museum is located on the beautiful Central Coast of New South Wales. 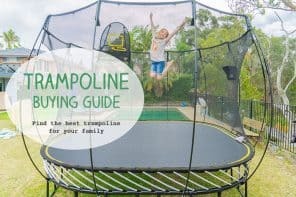 The area offers lots of kid friendly beaches and family friendly attractions such as the Australia Walkabout Wildlife Park. Very close by is also the Australian Reptile Park. Also, you can combine the visit of the Gosford Classic Car Museum with a short drive to vibrant Terrigal. 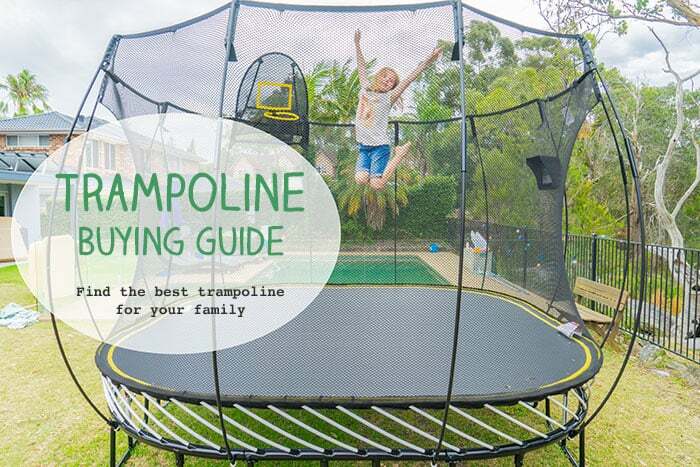 Click here to find all the information. Finally, if you like the Facebook Page of the museum, you will notice that the museum keeps posting very well made and edited videos about the cars. If you start watching them, you cannot stop. I don’t think I can decide which is my favourite car, too many! 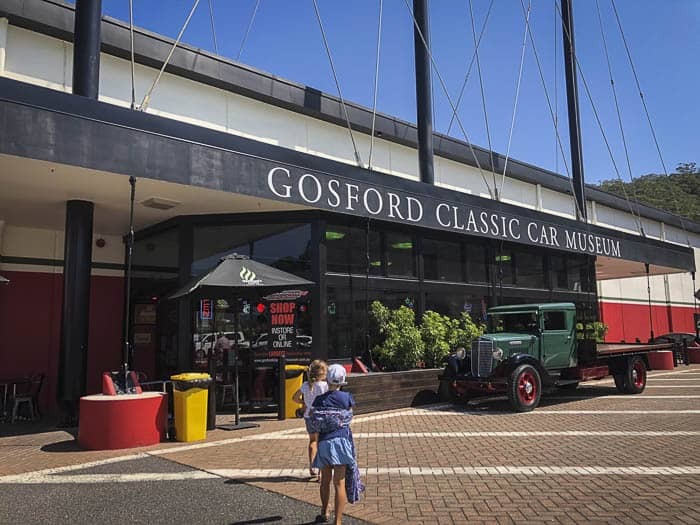 After reading this review, you might want to include the Gosford Car Classic Museum at the top of your bucket list. We had such a wonderful time! Visiting Museums is not only educational but also brings the family together. Don’t you think? We went last week, it was great for all the family!! !